Does what you drive affect how you drive? It appears so. Drivers beware of those behind the wheel of a GMC. Drivers of this particular brand of vehicle are more likely to have a less than stellar driving record. 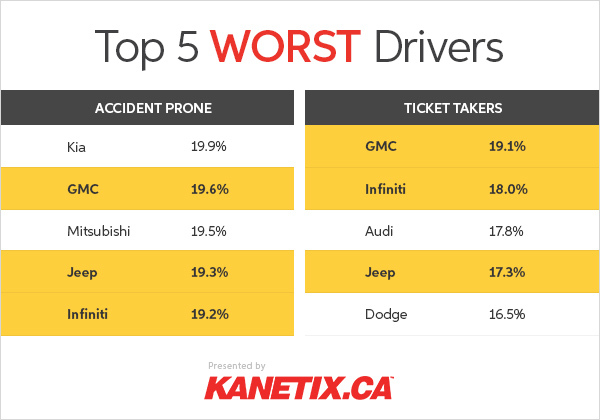 At least that's according to auto insurance quote data gathered from Kanetix.ca. Which car's owners make the worst and best drivers? That's the question we set out to answer when we looked at which of the most popular car brands attracted the best and worst drivers. Turns out GMC drivers take the title for being the worst with 19.6 per cent admitting to having an accident on their record and 19.1 per cent admitting to having a ticket. In contrast, the best drive a Toyota or a Honda. Of those behind the wheel of a Toyota, 16.6 per cent have been in a collision and 11.2 per cent have a ticket on their record. Meanwhile, only 16.1 per cent of Honda drivers have been in an accident and 12.7 per cent have a ticket. 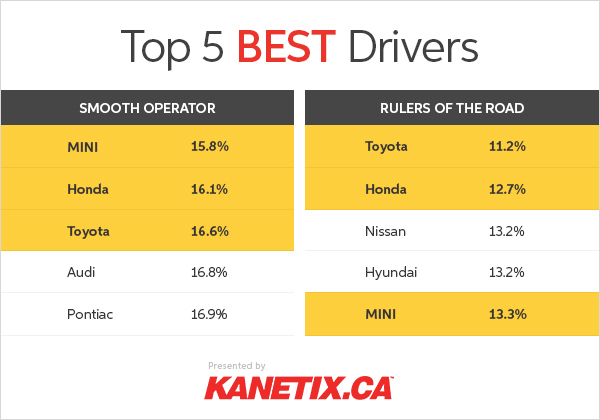 The average across the most popular brands is 17.9 per cent for collisions and 15.3 per cent for tickets. Almost one in five (19.9 per cent) of Kia drivers admit to having been in a collision, making them the most accident prone of the lot; while GMC drivers take the top spot for being the most likely to have a ticket. Repeat offenders, those vehicle brands whose drivers made both lists, are highlighted. At 15.8 per cent, drivers of the peppy MINI are the least likely to have a collision on their driving record, making them the smoothest operators on the road. Meanwhile, Toyota drivers are the most likely to mind the rules of the road and are the least likely to have a ticket. Your driving record is literally in your hands. Steer clear of high car insurance premiums. 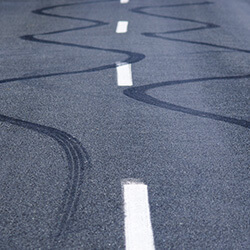 Your driving record matters; it is one of the most influential factors in determining your insurance rate. Sure, there are others like where you live, your insurance history, and the type of car you drive but your driving record and history is indicative of how you are when behind the wheel. Every at-fault (or partially at-fault) accident or traffic ticket conviction will likely increase the cost of your premiums. So no matter what you drive, drive carefully and mind the rules of the road to keep your car insurance premiums low.